The content of this introduction is aimed at technicians and therefore quite detailed. To be better able to understand this technical introduction, we strongly recommend that you read the easy demo and the medium demo first. Click on a Figure to see an enlarged image. The following explanations and protocol snippets serve as a more example based version of the official Shibboleth specifications. As shown in Fig. 1 the scenario is the same as in the easy demo and the medium demo but in this introduction background processes and interacting components are also considered. In the following, it is distinguished between the data sent from the user's web browser to the web server and the data received by the user from the web server. Sometimes important information is emphasized using bold text. For better readability the data is shown in URL decoded form, e.g. a '://' would be '%3A%2F%2F' in the real data. For layout reasons long lines were split and a backslash ('\') was inserted at the end of the line where this was the case. In some protocol samples some less relevant information was omitted. In that case this usually is shown with '[...]'. On the WAYF page, the user selects his Home Organization. The selection gets stored by means of a Session Cookie in the browser. So the selection has to be done only once per web browser session unless the user deselects the checkbox. The cookie is set in order to remember the user's choice for the checkbox 'Remember my selection for this browser session'. As the text states, the cookie is only available during the current web browser session. 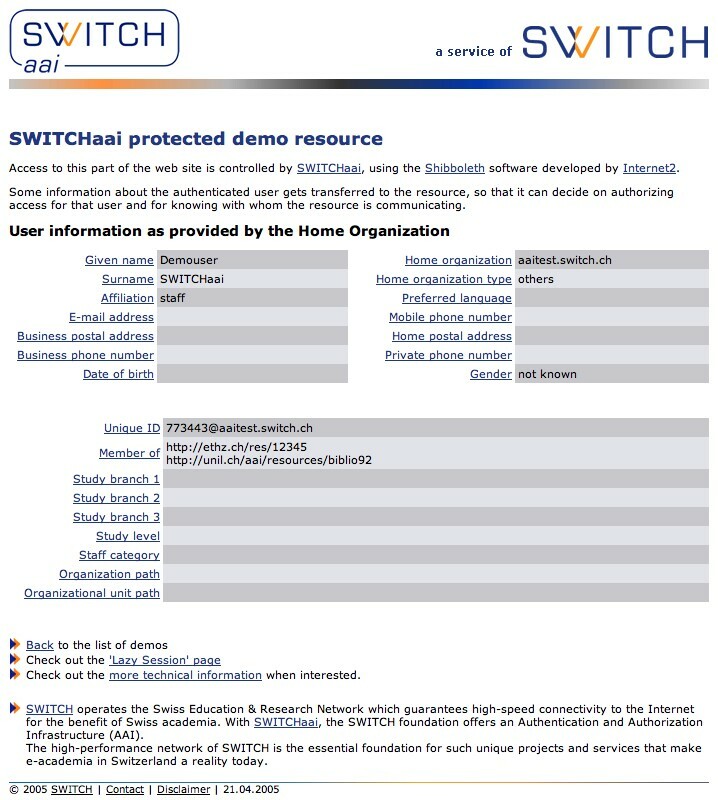 The user sees the login page of his Home Organization, in our demo this is the Test Home Organization @SWITCHaai as shown in Fig. 5. The single sign-on authentication system, which is independent of Shibboleth, checks the credentials against the local user directory. The web browser briefly shows a page that should look like Fig. 7. Because the user sent the handle generated by his Home Organization to the resource, the resource can now determine whether this user shall have access to the resource. To decide whether a user is allowed to access a resource, the mod_shib module embedded in the Apache web server examines the Shibboleth access rules. The following code snippet shows the Apache configuration for the test resource, including some additional commented out lines. Because the test resource can be accessed by every Shibboleth user, it can be used to display all the user's attributes. Therefore, the Home Organization is requested to provide all available attributes for this user referred to by the handle. 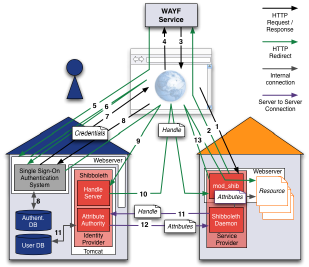 This request is directly handled by the Shibboleth daemon (actually it is the process named 'SHAR', the Shibboleth Attribute Requestor) and the Attribute Authority (AA) on the Home Organization side. 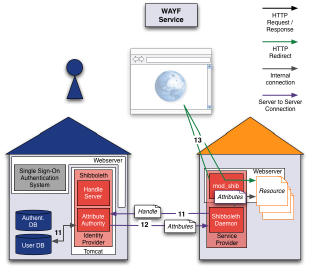 To request a user's attributes the Shibboleth daemon sends the same handle it received from the user in step 10. 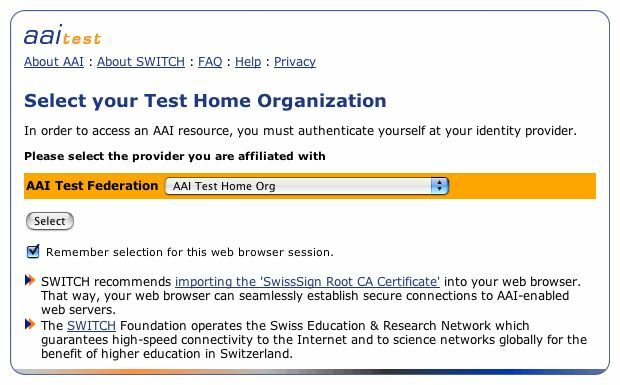 It is a SAML 'Attribute Request' message. After the HTTPS session establishment from the SHAR to the AA, the AA verifies the identity of the SHAR based on the server certificate provided by the SHAR. Once the AA receives the attribute request, it first examines the handle it contains. If it matches with a handle recently generated by the Handle Server it knows to which user it refers. Then the AA checks the Attribute Release Policy (ARP). This XML configuration file contains rules that determine whether an attribute of a specific user may be released to a specific resource or not. Depending on the Home Organization there is a general site wide ARP file defining the default set of rules and a user customizable ARP file with the user specific set of rules. The user's rules have precedence over the site wide rules. 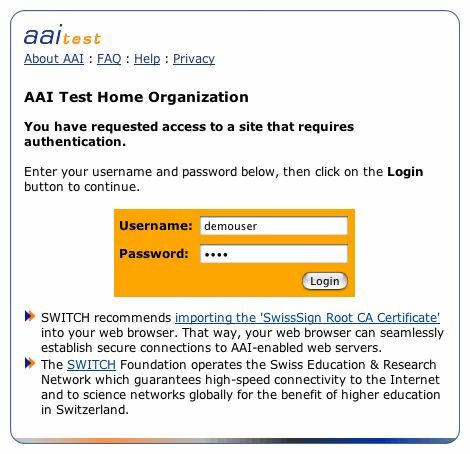 The AA answers with a Response message containing all user attributes allowed to provide to this resource according to the ARP evaluation. Finally, the user receives a Shibboleth session cookie and gets redirected to the resource of this demo. The attributes received from the user's Home Organization are provided by the mod_shib module to the web application as web server environment variables. Therefore, the resource could also use these attributes to further restrict access. 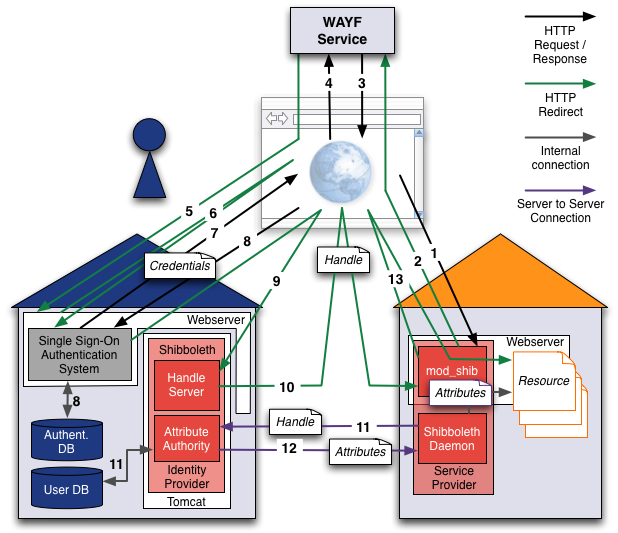 The web page of the demo resource should look like Fig 9. 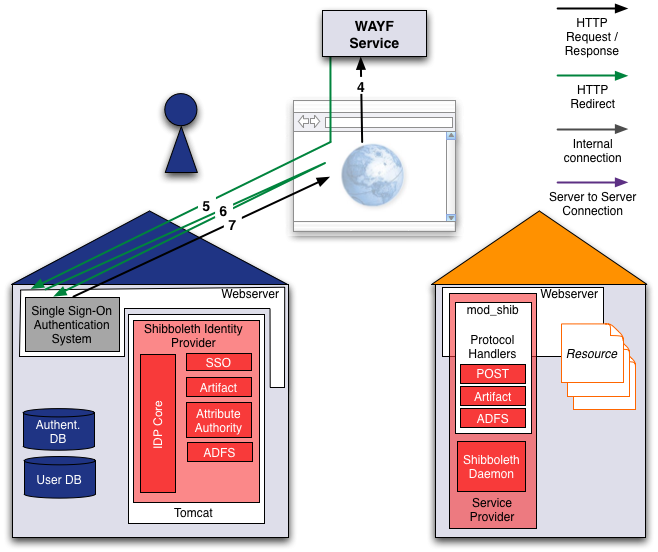 Subsequent accesses to the resource are granted directly until the Shibboleth session timeout (usually one hour? 3600 seconds) requires a fresh handle to be issued by the Home Organization.